Polish deadliest hate machine, Bloodstained, are back with a new release! 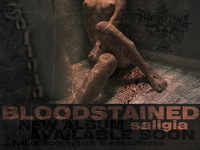 Their new album called Saligia will be out shortly on Ratel Records. Meanwhile, check out their myspace profile and listen to new songs they've uploaded recently - Wrath Innate and The Hell Is Yours (feat. Matthi from Nasty). War is coming!